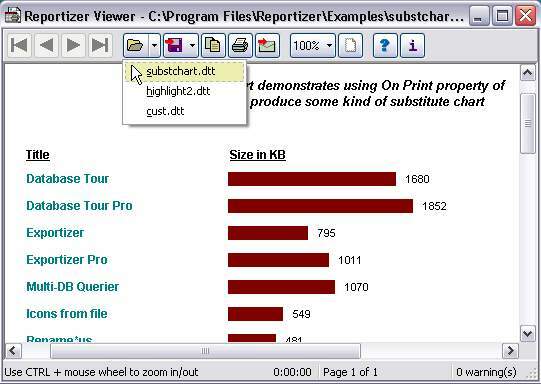 Reportizer Viewer is a database reporting utility.Unlike Reportizer, Reportizer Viewer allows only previewing, printing or exporting database reports, created in Database Tour Pro or Reportizer; it does not allow to modify reports. Additionally, it can print file list from folder, selected in Windows Explorer. Previewed report can be printed or exported to file (HTML, XLS, TXT).The most important operations (loading reports, printing, exporting). Reportizer Viewer is a database reporting utility. The most important operations (loading reports, printing, exporting, specifying SQL parameters etc.) can be performed via command line. This allows customizing the launching of the program for end user and using Reportizer Viewer calls from other programs. Qweas is providing links to Reportizer Viewer 3.17 as a courtesy, and makes no representations regarding Reportizer Viewer or any other applications or any information related thereto. Any questions, complaints or claims regarding this application Reportizer Viewer 3.17 must be directed to the appropriate software vendor. You may click the publisher link of Reportizer Viewer on the top of this page to get more details about the vendor.